Lemagne Sánchez with New York City supporters, including those from the sponsoring organizations, the New York State Nurses Association and 1199 SEIU. 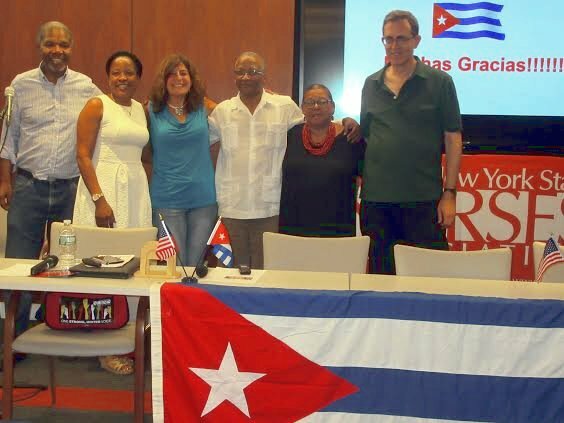 The New York City reception for Comrade Victor Manuel Lemagne Sánchez was held on July 8 in the spacious conference room at the midtown offices of the New York State Nurses Association, one of the two organizations sponsoring the meeting. Karen Jarrett, NYSNA’s downstate director of political and community organizing, opened the meeting by welcoming Lemagne Sánchez and the labor leaders, community activists and members of progressive organizations who support the Cuban revolution and were eager to hear him. Estela Vasquez, executive vice president of 1199 SEIU, the other sponsoring organization, extended the health care union’s support and spoke enthusiastically about her trips to Cuba. During his initial talk Lemagne Sánchez spoke about Cuba’s strong response to President Trump’s reversal of President Obama’s initiatives increasing U.S. travel to and exchange with Cuba. Then the labor leader gave a detailed PowerPoint presentation on the history of U.S. attacks on Cuban sovereignty, tracing the increasing severity of the blockade, which seeks to isolate Cuba and prevent global trade relations. But despite constant aggression by the U.S., the socialist country has prevailed at the United Nations where it has won internatlonal condemnation of the U.S. blockade. During the question-and-answer period, members of the Laundry, Distribution and Food Service Joint Board, a division of SEIU, spoke about how much their members have learned about universal, preventive health care delivery during twice-yearly trips to Cuba. Jarrett noted that NYSNA was interested in such educational trips. An elaborate variety of delicious finger food sustained the crowd and heightened the celebratory mood of the gathering. The meeting shows that more such global solidarity exchanges between unions would certainly be welcome in New York City.